In the past 11 ½ years that I’ve been at the library, I’ve seen a huge change in how people access materials and stay connected. Back in 2013, we had a few people using laptops accessing our wifi, but now along with large amounts using laptops, I see many people using smartphones and tablets as well. We had a few reference databases when I started, but now you can access even more 24/7 reference resources, eBooks, downloadable music, and now even movies and TV shows from Hoopla. It truly is an exciting time to be a librarian, as libraries and society quickly evolve in ways Melvil Dewey, Thomas Hatfield (HPL’s first librarian), and other early librarians could not have imagined. In honor of this I wanted to look at three books that span the tech revolution from life in the early industrial revolution days of Victorian England, our present information revolution, and William Gibson’s classic cyberpunk dystopian view of the future. The End of Absence: Reclaiming What We’ve Lost in a World of Constant Connection, by Michael Harris. 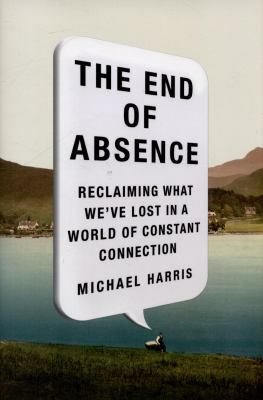 I was intrigued to read Michael Harris’ The End of Absence which focuses on what we as a society and individuals might be losing with all the exciting technology gains we are making. My life would be very different today without the digital world since I found my current job, my husband, my grad school roommate, my previous apartment, some friends, and three pet cats all online. Harris likens the current changes to those that followed the invention of the printing press and a move away from oral traditions to the printed word. The End of Absence is part sociology, part philosophical work, with a bit of memoir thrown in. I found the studies he quoted were mentioned so briefly and the meandering focus, made me drawn to the more personal aspects of the piece that occurred in the second half including when he attempted Analog August where he attempted to return to the lack of tech of his childhood including taping a cord to tether his cell phone so he couldn’t use it outside his home. For someone who was taking a stance towards the negatives of technology, he surprisingly met his partner online. I think in the end, the world The End of Absence describes calls for a need for balance. Technology has great promise, but should not replace basic human interactions. As the library has increased our digital offerings, we have also increased programs and study space to feed the need for social interaction and quiet learning that may be even greater now in the evolving digital age. I couldn’t help when reading The End of Absence thinking of the Cyberpunk genre of science fiction, where the future may be high tech, but society has begun to fall apart. My husband is a huge fan of cyberpunk including movies like the Matrix and his favorite Blade Runner. 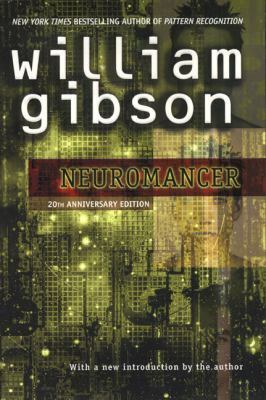 Nothing typifies this genre like William Gibson’s 1984 classic Neuromancer, which I was inspired to reread again twenty some years after I had my first encounter. The novel tells of a damaged computer hacker, Case, who is “fixed” by his mysterious employer in order for him to assist in an epic dangerous hack. I felt the slang that Gibson uses for his characters was engaging and the twists and turns the story takes as told from the addled perspective of the main character were exiting even if some of the technology depictions seem now dated. Although the characters with their criminality are not the most sympathetic bunch, I found there was something very charismatic about Molly, the main female protagonist, who due to having permanently had lenses affixed to her eye sockets can no longer cry, but when sad must spit the way her tear ducts have been rerouted. She also retractable cat-like claws. This engaging femme fatale first appeared in Gibson’s Johnny Mnemonic and returns in his Mona Lisa Overdrive. The dystopian high tech Japan Gibson created as the main background is compelling, even if as with the rest of his future world, you might not want to live there. 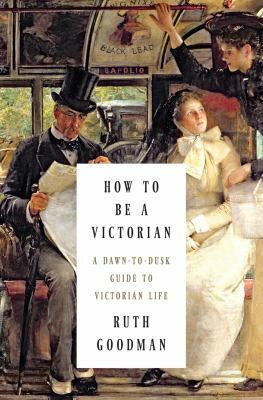 How to be a Victorian: A Dawn-to-Dusk Guide to Victorian Life, by Ruth Goodman. All this talk of high tech dystopia, made me long for the simpler times of the past. Ruth Goodman’s How to be a Victorian does a great job of capturing the Victorian daily life. What I especially liked is she brings some of her personal experiences as a reenactor to the account so she describes not only what would have been worn such as a corset or tasks which would have done such as doing laundry, but as a modern woman what that experience is like. It made me realize how often we look back at the past with nostalgia, but that often new technologies free us from hard manual labor. The book looks at the lives of all levels of Victorian society from the poor, to the working class, to middle class, to the wealthy. Although Goodman is British and the book was originally published in the UK some specific American differences in lifestyle for the Victorian era are mentioned. I especially thought the section dealing with medical practices was fascinating with its look at the balance between the new “scientific” beliefs of male doctors as contrasted with the herbal and folk remedies practiced by wives and mothers. It made me wonder which of our medical practices in another hundred years may appear to be barbaric and silly. Goodman spends quite a bit of focus on Victorian dress and styling so those looking to create authentic costumes or get inspiration for fanciful Steampunk creations may enjoy her descriptions. There are some black and white and a few full color illustrations included. As much fun as going to a recreation Victorian tea party may be, I feel lucky to live in our present era with its washing machines, dishwashers, and other modern conveniences.